InDesign’s Data merge is a wonderful feature that allows you to generate several unique PDFs from a single CSV file. This is traditionally used to print thousands of envelopes or mailers, each with a unique address or some other varying information. 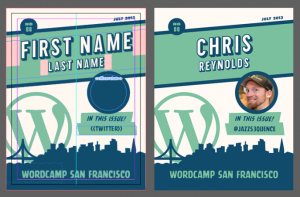 We can use this feature to print a large amount of conference badges, perfect for WordCamps! This example in this article will produce a badge that includes a first and last name, Twitter handle, and a Gravatar. If you don’t have a copy of InDesign, you can download a trial version. If you have a layout program that you prefer to InDesign and have already written a script for it – or would like to work with us to write a script – please email support@wordcamp.org to tell us all about it. 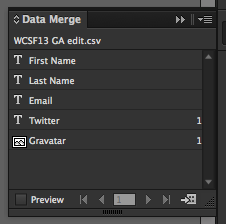 The file won’t have the Gravatar info at this point, but we’ll get to that next. Next you’ll need to run a script that will take the CSV of CampTix attendees, download their Gravatar images (based on the email that the attendees gave), and generate a new CSV with an additional column for the images. We’re working on making this process more user-friendly, but for now it’ll be easiest if you ask a developer on your team for help. Download a copy of the script. Note that the header for the image column has to begin with “@”. This lets InDesign know that that column contains images. If no Twitter handle was provided, then fill in the empty cell with their first name. Depending on the badge design, you may just want to leave that cell blank. If the attendee didn’t put “@” at the beginning of their Twitter handle, add it in. If the attendee has no Gravatar, add in “mystery-man.jpg” as the filename. The “mystery-man.jpg” will serve as the fallback image. Now that you have a proper CSV file you can create the merged document. If you have any static artwork, place it in a Master page, and then make sure that your first page has that Master page applied. Next, place text frames and image frames (if you’re using images) where you’d like the varying content to go. It’s easier to adjust the font, color, size, etc. after you have placed the content from the CSV file. You can download our sample template, or make your own. 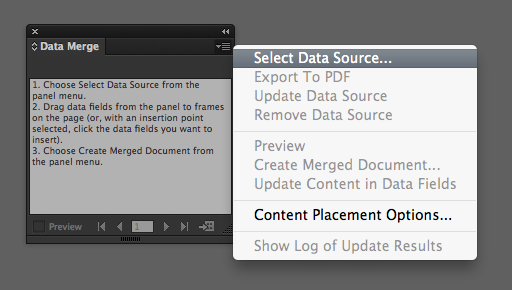 Make sure you have the Data Merge panel open by going to Window > Utilities > Data Merge. Select your CSV file by going to Select Data Source… in the flyout menu. It’s important to note that you can have several text frames with the same header value, which is how I made the shadowed text effect. It’s just 3 different text frames on top of each other, each set in a different font. Depending on the printer’s preference, you may need to split the generated PDF into separate ones. The possibilities are endless! 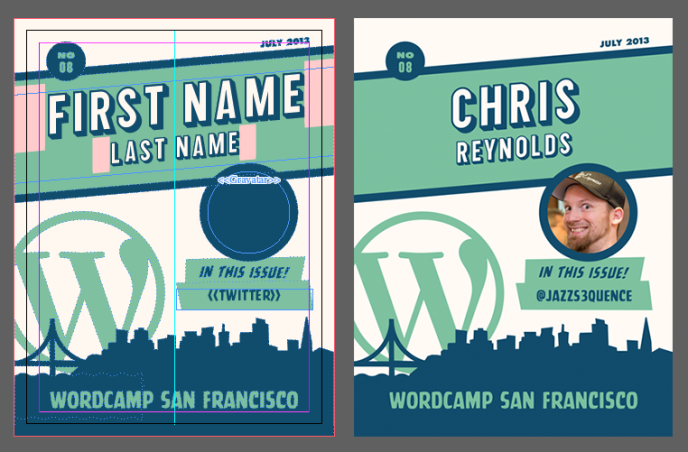 You can run the PDF through a batch Photoshop action to automatically apply some texture to the badges if you wanted. This process is the first iteration of this functionality, and there’s a lot of room for improvement. If you’d like to help make it better, you can contribute feedback and code to #262-meta.